Recap of the trip. 28 Countries. Over 100 cities. 390+ days. One hemisphere. Now with a map! 1) Late March to Mid July - Portion 1. Started in Rome, Italy, explored northern Italy, went to Slovenia, then 2 1/2 months in Spain, with a little bit of Morocco thrown in. 2) Mid July to Late August - Eastern Europe - From Germany, to Prague, to Poland, Hungary (where I split and went solo) to beautiful Romania and electric Bulgaria. 3) Alone in Eurasia - Trekking it solo through Turkey, the Emirates, and Nepal. 4) November to early April - Southeast Asian Adventure - 5 months, no maps, no plans, just a backpack and a road to the wild world of SE Asia. Included Thailand, Laos, Cambodia, and Malaysia. 5) Last two weeks - a quick jaunt visiting Kohei and Varun in Japan. This is the pre-trip Map. Below is what I wrote as the explanation of the swirls. 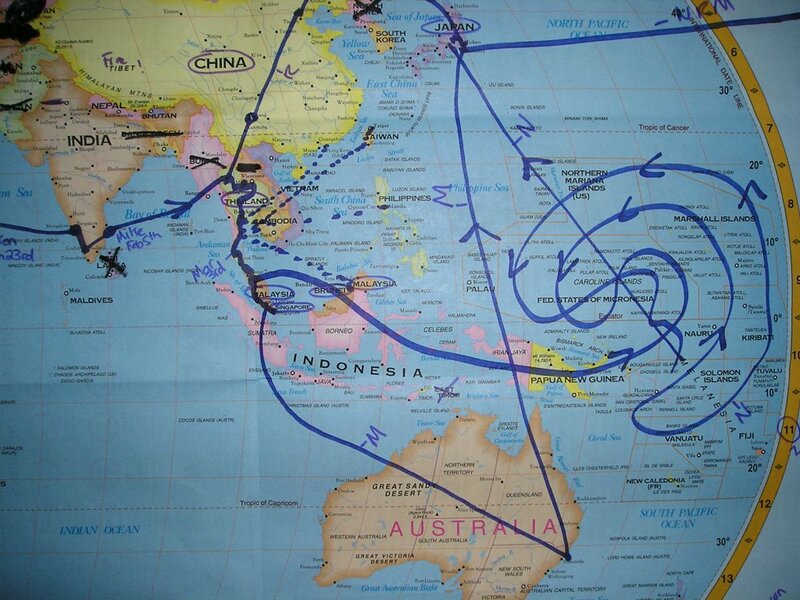 On the map, that is the swirl, me on a boat drifting among the south pacific. Probably not what I'll actually do. Ryan and Aaron may go to China (a country, that, if I go, I probably will get arrested in for my political views). Mike and Brandle plan to go to Australia (too far under for me). I may stay in SE Asia, go to Japan, maybe Aussieland or New Zealand. Maybe back home, if I get a chance to work on a political campaign, and maybe South America (though probably too costly). This is 9 months into the trip, who knows that will have happened by then, its hard to make any assumptions at this point.